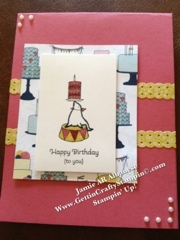 I love this fun Circus Stamp set and how the cake mimics the cakes on the Patio Party DSP. With the new In Color Primrose Petal and Summer Starfruit along with Regal Rose really pull this card together. 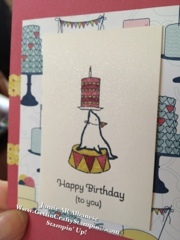 I stamped the lil Seal on Shimmer Paper for a dash of bling! It was just a dash too plain do I added these cute Self Adhesive Pearls to the corners. 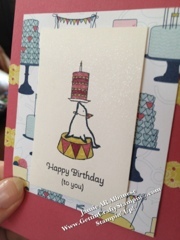 I then used our Stampin' Write marker in Midnight Muse and traced the seal to give it a colored feel. 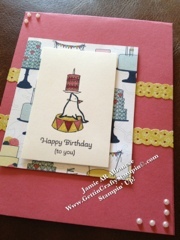 The Dotted Scallop Ribbon Border punch mimics the scallop on the cake. I love how our DSP is 2 sided with coordinating patterns! Easy peasy! Happy Birthday to our dear friend Brenda! 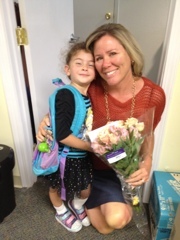 She is the best PreSchool director and a wonderful light in our lives!